May is my month! I was born in May not too many years ago, and where I was born in India, this is a hot, Summer month. There, May is also the month of mangoes. If I was in India now, I would be eating a mango with every meal and some in between. I am making May the month of mangoes, with many if not all of my posts dedicated to the “King of Fruits.” This was also the first batch of the mango season which I found ripe and sweet enough in Seattle, so the first dish I made was Mango Shrikhand.Shrikhand(“shree-khund”) is yogurt drained of all its liquid, then sweetened and spiced with any flavors you like. It is not so much an Indian dessert as it is regional, and very popular in my home state of Gujarat. Yogurt itself is widely eaten all over India, especially in Summer because of its cooling properties. I loved shrikhand so much as a kid that I would eat it plain, even with no fruit, just cardamom. My school was right next door to a big creamery — the largest producer of packaged shrikhand in India (it was like going to school next to Breyers). Once each year the school took us on a field trip, a tour of the shrikhand manufacturing and packaging plant; boy! how I waited for that trip! Usually the shrikhand we ate at home was not packaged, we made it ourselves as we also made our own yogurt. Here in Seattle though, it is harder to get the milk to curdle with our relatively cool, damp climate. We still make yogurt at home, but often turn to the best we can find locally. In Seattle we are fortunate to have many alternatives! Greek Gods is one locally manufactured yogurt that has been perfect for shrikhand. They are available all over the U.S. — try their Store Locator. Greek Gods yogurt is a strained yogurt, so it cuts my shrikhand-making work in half. It is so fresh and high quality that it is the closest thing to the home-made shrikhand I grew up eating! Brown Cow is another one my favorite thick yogurts. If you can’t find Greek Gods or Brown Cow, for one alternative you can use regular yogurt, with a little more work. You will need to tie it up and hang it in a cheese cloth overnight, to drain the water. Kefir cheese and any other plain, Mediterranean style, strained yogurt will work the best and you may be able to avoid the draining step. Strained yogurts are also manufactured with a higher pectin content, so they will require less sugar than a regular yogurt you strain at home. Depending on how fresh the yogurt is and other factors, its tartness will vary. Sugar levels vary widely, and this is one reason it is hard to give precise measurements in recipes for traditional foods. You have to trust your tongue, taste as you go, and learn by doing. 1. Take the yogurt in a medium bowl and hand-beat with a whisk, till it is nice and smooth. It takes about 3 minutes. 2. Mix in the sugar next. Taste it! If it tastes acidic or “too yogurty,” you need more sugar! 1/2 cup is what I needed to turn this yogurt into Shrikhand, you might need more or less. 3. Add the cardamom and mix. 4. Cover and refrigerate. It will solidify slightly, too. 5. Right before serving, top with nuts and mangoes. What a lovely dish MPG. Strained Greek yogurts are the best and this dish sounds even better with the addition of the cardamom (yes a little goes a long way). And of course the mangoes! I can just tell how sweet that mango is by looking at the photos! Geez louise!! That mango looks so beautiful! I’m going down to the market later today…have to look for some beautiful lush mango! Peter G – Thank you 🙂 Yes, I love Greek yogurt!! And, yes there is a reason why spices and condiments are used in moderation just like dried herbs. I am glad you agree.Dhanggit – Thanks woman! Let me know how it turn out.Mandy – Yes, it really is true if a mango is good, you can really see it. This one was mouth-watering sweet!Cakespy – You go girl and keep me posted where you found the good ones 😉 I like to try all different places to buy and varieties to try. Shrikhand is my favorite too (though I also love its cousin kalakhand) When I was a kid, my friends mom used to serve this with puris; just to fatten us all up. Shrikhand is a favourite in our house too, my grandmother used to freeze it into ice lolly mould wen we were kids too, it was delicious.A question for you, she also used to make a light rice pudding, flavoured with saffron which we had with puris…. what was it? I’d love to make that again. MMMMM, That looks so yummy! Mangoes are also one of my passions. 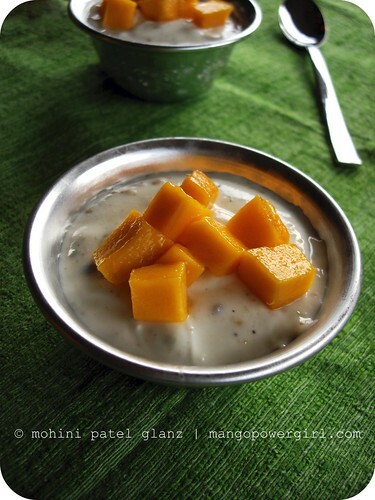 This is a perfect dessert for me: mangoes and yogurt! I’ve gotta make this soon! Hi Julie, this is the first time I am visiting your blog and I am very happy a mutual friend (Swati the Sugarcrafter) send me a link with your recipe as I asked her to suggest some recipes with cardamom. 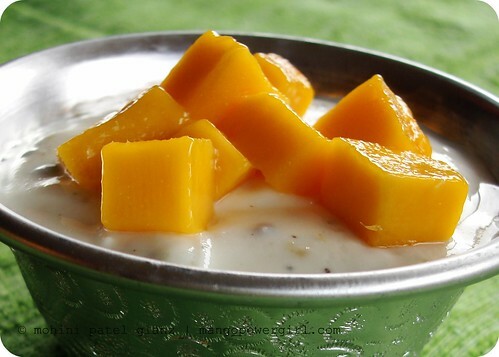 I am glad she sent your link and I think this Mango Shrikhand is perfect to start with. I only have cardamom pods. Do I use the seeds as they are or do I have to pound them? I also see that we have some other mutual friends. Sorry for the mistake in your name Mohini. I also wanted to correct that Swati, of Sugarcrafts in India, sent me the link to your post, although Anamica is also a friend. That looks delightful. Thanks for the tip on the Greek yogurt. I’m going to have to give this a try! Looks great. It reminds me of something I had in an Indian restaurant once…kheer. I loved that stuff, but I imagine that was a lot more liquidy than this stuff. Nice topping with the mangoes! The mango looks so juicy. Lovely dessert! Came here thro’ Kajal’s blog.Belated birthday wishes.Love the look of your shrikhand. It does go really well with pooris. Wow, this looks so very delectable. Thanks for leaving me a comment. I have linked your recipe into my post. The Blueberry version is absolutely delicious too. This recipe saved my life… Ok, maybe I am exaggerating but I just found out I am pregnant and am looking for super quick, healthy desserts to satisfy my sweet craving and my constant hunger. This is PERFECT. I made a batch of the shrikhand yesterday with fat-free Greek yogurt, we ate some with mangoes (unfortunately not great ones) but I plan to eat the leftover shrikhand with all kinds of fruit toppings – berries, plums etc.Thank you so much for a hassle free delicious recipe which still tastes like something I slaved over :)Btw – just discovered your blog thru this recipe – we just moved to Seattle and I am looking forward to reading your posts!